Late summer into early fall is the peak of migration. About 75% of all the hummingbirds in the eastern half of the US migrate through Texas. Out of 18 total species in the US, there are only two abundant species that nest in the east. They are the ruby throated and the black chinned, with the ruby throated being the most abundant. When I lived in Coppell I had only black chinned all year long. Here in McKinney I have just the ruby throated. They both spend the winter south of the border. The number of birds migrating south may be twice that of the northward trip, since it includes all immature birds that hatched during the summer, as well as surviving adults. That is why people are seeing so many. It is important to leave the feeders up as long as possible. Many of these birds fly non-stop, 500 miles across the Gulf of Mexico, an 18-22 hour trip. They have to double their fat reserves to make this trip so they need all the help we can give them. - Tony Manasseri. 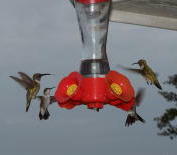 Hummingbirds can be an important part of your organic program. One sure way to limit their presence is to spray toxic chemical pesticides. Not only are hummingbirds beautiful, and helpful with pollination, they help with insect control, reducing the need of pesticides. Hummingbird feeders are helpful in attracting these beautiful little birds in the summer, but clear sugar water is all that is needed if the feeder has red tips on the tubes or other red color to the feeder. To make the sugar solution, add one part of sugar to three or four parts of water. It is important to change the sugar solution often – ever one to two days so the solution does not spoil and cause disease in the birds. Also, plant red-blooming plants such as cypress vine, gregg salvia, coral honeysuckle, Turk’s cap, red columbine and trumpet vine. Especially good are plants that have long and tubular flowers. Other good choices include flame acanthus, pomegranate and red yucca. Hummingbirds also eat flying insects such as mosquitoes and gnats. That’s what they are doing when darting around the garden. Hummingbirds are attracted to flower colors and nectar, not fragrance. 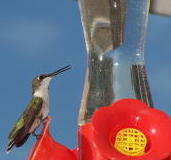 Some cultivated hybrids produce less nectar than their wild counterparts, but they can still help attract hummingbirds. Bee balm - Monarda spp. False indigo – Baptisia spp. Purple coneflower – Echinacea spp. Tuberous Begonia - Begonia spp. Trumpet vines – Campsis spp. Flowering quince - Chaenomeles spp.